Frustration has led many people to severe actions, but none can compare to leaving a baby in a dumpster. In 2003, Pennsylvania’s state legislature created and passed a law called The Newborn Protection Act. The legislation was created so that any parent could voluntarily relinquish their child to a hospital without any questions asked. Coincidentally, this was the same year “Baby Allison” was found. 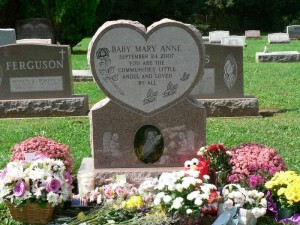 A newborn, given the name “Allison” after her death, was found in December lying in a Strasburg Township burn barrel, according to findagrave.com. Since then, every hospital in Pennsylvania has become a “safe haven” for newborns. Bassinets are set up in the hospitals and all a parent has to do is lay the child down and walk away; not even names or addresses are written down. Safe haven laws aim to prevent infant deaths. An age limit was set a few years later due to problems in some states. “Nebraska had no age limit, and parents were dropping off their teenagers,” said Susan Savage, an advocate of the Safe Haven Program. Infants must not be older than 28 days to be dropped off. The child, after it is examined, is taken to a foster program. As long as the child has no signs of abuse, parents will not receive any punishment. Since the program was developed seven years ago, the question is: why build up awareness now? While it is a good effort, the idea did not spread as well to everyone. In Sept. of 2007, a baby was found in a trash bin behind the Lancaster YMCA, hidden in a canvas tote, according to findagrave.com. After investigation, it was announced that the baby had died due to suffocation. Donations from the community paid for a heart-shaped tombstone. The community members named the baby “Mary Anne” and over 100 people showed up to the funeral. Reverend Daniel Mitzel, who presided over the service, said the baby was like family. “We immediately felt that baby, as any other member of the human race, deserved a burial with prayer and faith,” said Mitzel. If you have any questions about the program visit www.secretsafe.org to learn more. This is one of the best articles I have seen on Penn Points. Very touching. This is a very sad article. I don’t know how people can just put their baby’s in dumpster and just leave them there. And not care what happens to them. I thing that this is the saddest story I had herd in a long time and it was very touching. I also thing that this is a good story to people to read in Penn manor.